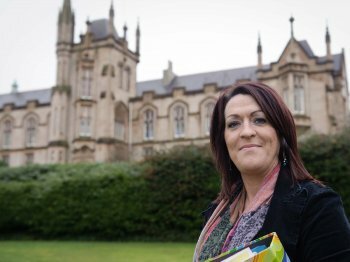 A County Donegal woman, who returned to education in her 30s, believes a University of Ulster Masters course has brought her one step closer to securing a job near her home. Marie Duffy, from Carrowmena, outside Moville, will complete her Masters in Business Studies at the University’s Ulster Business School, based at the Magee campus in Derry this month. And, she has already been offered employment but is completing her exams first. “I’m in talks with a local company about a managerial post – nothing is concrete yet but I’m delighted to be in the running as it’s so difficult to find work at the moment and I’ve no doubt the course has helped me,” said Marie. “Previously, when I applied for jobs in Northern Ireland I found that I had the experience but not the necessary education requirements. Marie, 36, had serious doubts about embarking on the course having been away from the classroom for some time. “If I’m honest I had a major fear about doing this course, I had been out of education for years and the thought of assignments and exams didn’t appeal to me but my family encouraged me and I went along to an open night,” she said. “Grainne talked me through the layout of the course, the subjects being offered, the internship and the support available. I left that night feeling that maybe I could do it, so I signed up for the course and it was the best decision I have made! Marie had worked in managerial roles for the past 10 years, most recently as a claims manager for a health insurance company in Phoenix, Arizona. “I went travelling to America and ended up in Phoenix for the gorgeous weather and you’re only on hour’s flight away from Vegas! I started with the company as a quality supervisor and worked my way up. I thoroughly enjoyed my time in Phoenix and loved my job,” she said. She returned to the north west when her mother became seriously ill.
“Sadly my mother passed away but I decided to stay at home and find a job which proved difficult in today’s economic climate - my managerial experience wasn’t enough and that’s what led me to the University of Ulster,” said Marie. Course Director Grainne Tuohy said: “This programme is suited to graduates who wish to develop their business skills to a world class standard. The programme is structured around six modules per semester and is delivered over two days each week. The closing date for Master of Business Studies (MBS) applications is January 30th, 2012.